I'm a quiet high impact activist. Largely via event production and project work, I've lifted up and helped to move forward the fields of integrative medicine, regenerative urban development, permaculture, pilgrimage, keeping kids in nature, the arts (especially local musicians, poets and visual artists), new economics and indigenous language revitalization. I'm also an intuitive and poet who does personal coaching for progressive and aspiring politicians and others in leadership roles. When I was still in University back in the early 1980’s I woke, at 3:20 am from a dream that there was a fire at a particular intersection in downtown Edmonton where I lived at the time. I went back to sleep and then woke with the alarm sometime later. The news was on the radio and the first story I heard was that there had been a fire that started at 3:20 am at the same intersection that my dream had been about. That’s my first conscious memory of having intuitive capacity. In the past 10 years in particular, but certainly long before that too, I’ve been working at integrating and using all the ways I have of knowing things, including intuitively. When I took a tea leaf reading workshop in late 2015, I knew I’d found a tool that would work for me to start doing intuitive readings to pass along to people what’s showing up in the field for them to know. Since then I've also added "Throwing the Bones" as a tool. Most people know me as a leading-edge event producer and project manager, and that’s still true. I’m a natural convener and organizer! And now, I’m an intuitive guide as well. I’ve been quietly working one-to-one with clients for over 20 years and I value the solid ground of practical coaching skill integrated with the beauty and depth of the mystical. Tea and the objects in Bones Throwing, for me, brings both forward. Cynthia Bourgeault – is the main teacher, author and retreat leader for The Contemplative Society who works deep in the contemplative and ancient wisdom traditions of Christianity. Her modern grounded work in this vein has helped me reframe much of my personal and genealogical spiritual background into something that makes broad sense to me. I’ve been working with her on and off for over 13 years. Keith Clifford - has been my friend and husband in phases for over 35 years now. His understanding and capacity to hold space for my growth, and to let me hold space for his, is unparalleled in my life. My gratitude and love for him as my beloved husband know no bounds. Hannah Berry - is my, now adult, daughter. She is my teacher in the way only ones' child can be. Humility, patience, listening, service, boundaries and unconditional love are just a few of the teachings I've received in stages over the years with her. Nicole Powell - taught me to read tea leaves. I'm forever in her debt for this gift. ​---- and the list goes on! 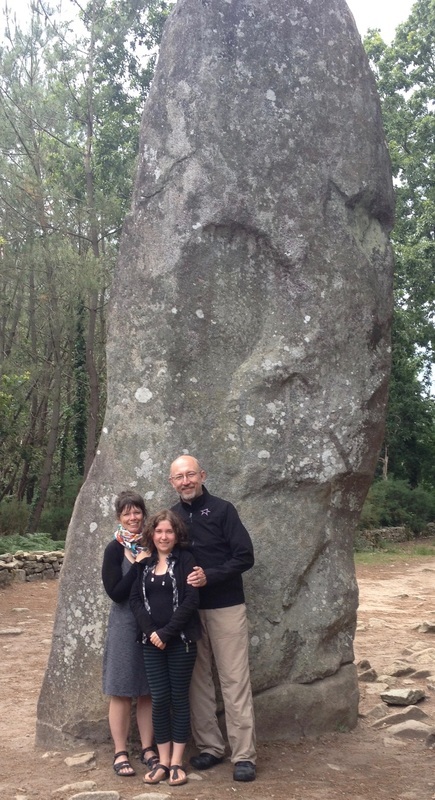 My husband, daughter and I in front of le Géant de Manio in Carnac, France in 2016. Always move toward that which supports Life and Peace. That's my mission. I work on it every day. I work in service to clean water, healthy air, nourishing soil, intact stones, minerals that stay in the ground, cultural and language diversity, the ancestors, those to whom I will be an ancestor, robust relationships and all living things that depend entirely on these things we have in common. All things are sacred. How would you and I live differently if we integrated just that thought - all things are sacred - into our daily actions? Trees, plants and all other forms of tiny and larger wildlife figured out how to live here on earth a long time before humans came into the picture. We'd do well to listen to their songs and hear what they are telling us. ​Lakota leader Black Elk taught, "All things are our relatives; what we do to everything, we do to ourselves. All is really One." The following is one way I think practically about this generations-long, nuanced and complex undertaking toward the allyship, support and regeneration of the elements of life on earth and peaceful relations. Sometimes I call it radical inclusion. "Allyship to me isn't an obligation to someone, it is a devotion." *This list flows from permaculture principles and practices, especially as described in Regenerative Enterprise by Ethan Roland and Gregory Landua. Wisdom – To paraphrase Cynthia Bourgeault, wisdom is not about knowing more stuff, it’s about knowing with more of you. In the Wisdom Tradition the heart is an organ of perception, keeping us aligned with the vertical axis of timeless reality as we journey along the horizontal axis of our life. "We believe this path must be founded on a deep understanding of our place within life and nature. We are the only species capable of profoundly altering the biosphere. That must inspire us to humility, not arrogance; to stewardship, not exploitation; and to social solidarity, not competition." "Our shared life needs all of us, needs us awake and aware and alert, needs us rested and calm and clear, needs us listening deeply and responding with an open heart. And make no mistake- we can say, "No!" to that which causes suffering and threatens life, without closing our hearts- if we take care of those hearts. ​When the elders ask us to proceed prayerfully, what do they mean? To be prayerful is to be in awareness of the sacred. We too easily forget the sacred, whether in relationship to human beings or to other-than-human beings like trees, soil, and rivers. If prayer is sacred speech, then to act prayerfully is to be reverent in action as well as speech. The dehumanization that leads us onto the warpath is the opposite of reverence. Wisdom is a love affair with questions. Knowledge is a love affair with answers. This is a commonly referred to concept which reflects the interconnectedness of all. 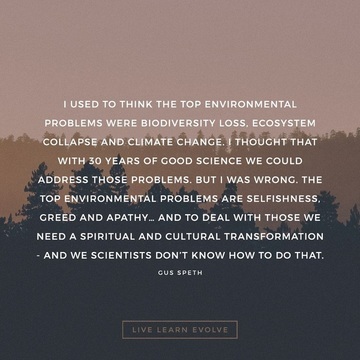 Gus Speth is an American environmental lawyer and advocate.